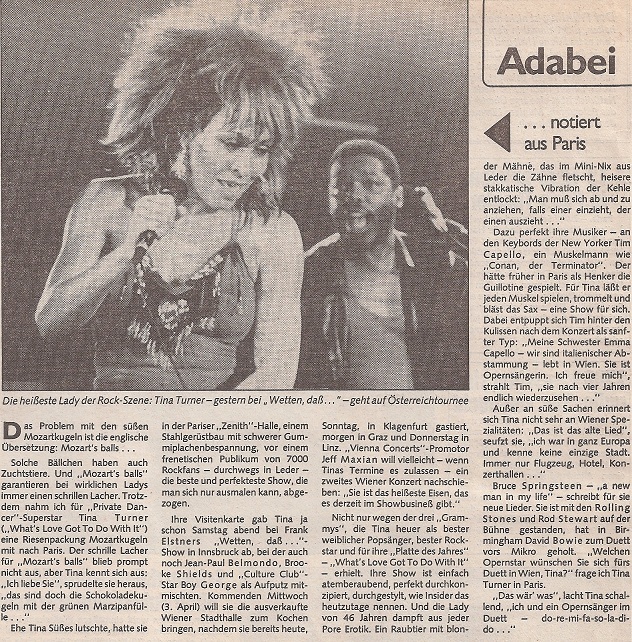 27 years ago today, Tina Turner performed at the Zénith in Paris as part of her 1985 Private Dancer world tour. Below, you will find the songs I Can’t Stand The Rain and Help, taken from an audience recording of this show. Also, you will find a review of the concert that appeared in an Austrian newspaper (in German), and the set list of the concert. Thanks to Hans for providing the newspaper article! Buenísimo!!!! con esa gira del año 85 fue que me hice definitivamente fanática de Tina Turner . de las versiones que más me gusta de Help es la de esa gira. 27 years… and I was thinking about 25 years! I was 4 years old at the time and I have idolised Tina ever since. I still often watch this concert.It’s a shame the full version is not shown, we miss out on great live songs like steel claw. Luckily, proud mary,nutbush and river deep are on other live concerts. Yes, the full show in Birmingham must have been recorded. I say it is time for Tina and her team to start opening the vaults and re-release this concert with bonus tracks on dvd and blu-ray! Thank you GUYS for that gift!!! I experienced Tina in Cologne-Sporthalle on 1.Mai 1985 (I have still the ticket to remember). This recording from Paris is “chaleureux”. Mercie pou cette cadeaux. Je vous en pris Marko! Great that you were able to see her on this tour, what an opportunity.